Man, I swear that if I ever had to pick a crafter that has grown in their design abilities in the least amount of time it would be you!! Each and every card you post is better than the last and so good! You are amazing! How completely creative to pop different butterflies on each layer! What a funky card! Love your bright colours and offset panels, fabulous idea! I love those popped up butterflies and the off set colour blocks. I too had a really hard time picking for the gallery idol. i had it narrowed down to 3 then printed them out, layed them down side by side and forced myself to choose! I really like this card - the colours look amazing. The butterflies are stunning! As for Gallery Idol - I've voted. It was a tough choice. Great card - love the butterflies that you popped up. Thanks for playing along with us at ColourQ this week. Cool! The butterflies look like ruffles--I love it! Awesome take on the color challenge. You crack me up about the Gallery Idol voting. I hope you got a chance to vote. So what's up with the "save photo for web?" I'm not familiar with it, but I do go in and change my pics' html. Your photos look great to me! Get out! This is amazing, Jen. I don't even recognize that stamp but I love the way you used it and the way you popped some of the butterflies. Great design!! Lovely card, Jen! Love all those butterflies. 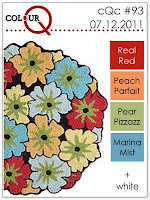 Thanks for joining us at the ColourQ this week. This is absolutely perfect, Jen! Love how you popped up the butterflies and offset the color strips. Beautiful job with the challenge colors! Thanks for playing at the ColourQ this week! Wow Jen - this is fantastic. Love your stamping technique. You nailed the color in that challenge photo. So glad to have found your blog - love your work! 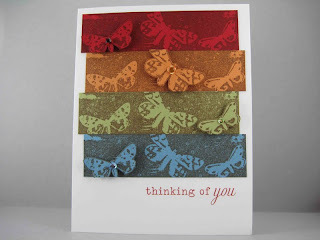 Super fab way to use this butterfly stamp! LOVE the way you created the 3D butterflies--FABULOUSLY done!!! So pretty! Love the technique you used.